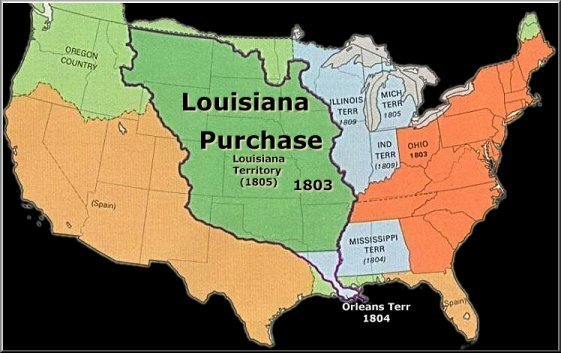 The Louisiana Purchase Agreement, or the Louisiana Purchase, (French: Vente de la Louisiane "Louisiana Sale") was the acquisition by the United States of America of 828,800 square miles (2,147,000 km2) of the French territory Louisiane in 1803. The U.S. paid 60 million francs ($11,250,000) plus cancellation of debts worth 18 million francs ($3,750,000), a total cost of $15,000,000 for the Louisiana territory. The Louisiana Purchase Agreement encompassed portions of 15 current U.S. states and 2 Canadian Provinces. 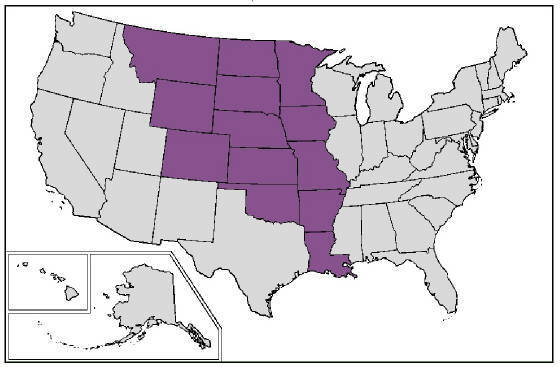 The land purchased contained all of present-day Arkansas, Missouri, Iowa, Oklahoma, Kansas, Nebraska, parts of Minnesota that were south of the Mississippi River, most of North Dakota, nearly all of South Dakota, northeastern New Mexico, northern Texas, the portions of Montana, Wyoming, and Colorado east of the Continental Divide, and Louisiana west of the Mississippi River, including the city of New Orleans. (The Oklahoma Panhandle, and southwestern portions of Kansas and Louisiana were still claimed by Spain at the time of the Purchase.) In addition, the Purchase contained small portions of land that would eventually become part of the Canadian provinces of Alberta and Saskatchewan. The land included in the purchase comprises around 23% of the territory of the United States today. The purchase was a vital moment in the presidency of Thomas Jefferson. At the time, it faced domestic opposition as being possibly unconstitutional. Although he felt that the U.S. Constitution did not contain any provisions for acquiring territory, Jefferson decided to purchase Louisiana because he felt uneasy about France and Spain having the power to block American trade access to the port of New Orleans. On April 30, 1803, the Louisiana Purchase Treaty (called by some, "the letter that bought a continent") was signed by Robert Livingston, James Monroe, and Barbé Marbois in Paris. Jefferson announced the treaty to the American people on July 4. After the signing of the Louisiana Purchase agreement in 1803, Livingston made this famous statement, "We have lived long, but this is the noblest work of our whole lives...From this day the United States take their place among the powers of the first rank." The United States Senate ratified the treaty with a vote of twenty-four to seven on October 20; on the following day, it authorized President Jefferson to take possession of the territory and establish a temporary military government. In legislation enacted on October 31, Congress made temporary provisions for local civil government to continue as it had under French and Spanish rule and authorized the President to use military forces to maintain order. Plans were also set forth for several missions to explore and chart the territory, the most famous being the Lewis and Clark Expedition. France turned New Orleans over on December 20, 1803, at The Cabildo. On March 10, 1804, a formal ceremony was conducted in St. Louis to transfer ownership of the territory from France to the United States. Effective on October 1, 1804, the purchased territory was organized into the Territory of Orleans (most of which became the state of Louisiana) and the District of Louisiana, which was temporarily under the control of the governor and judges of the Indiana Territory. From the first shots fired at Lexington to the signing of the Declaration of Independence to the negotiations for the Louisiana Purchase, Ellis guides us through the decisive issues of the nation’s founding, and illuminates the emerging philosophies, shifting alliances, and personal and political foibles of our now iconic leaders—Washington, Jefferson, Madison, Hamilton, and Adams. He casts an incisive eye on the founders’ achievements, arguing that the American Revolution was, paradoxically, an evolution—and that part of what made it so extraordinary was the gradual pace at which it occurred. He shows us why the fact that it was brought about by a group, rather than by a single individual, distinguished it from the bloodier revolutions of other countries, and ultimately played a key role in determining its success. He explains how the idea of a strong federal government, championed by Washington, was eventually embraced by the American people, the majority of whom had to be won over, as they feared an absolute power reminiscent of the British Empire. And he details the emergence of the two-party system—then a political novelty—which today stands as the founders’ most enduring legacy. But Ellis is equally incisive about their failures, and he makes clear how their inability to abolish slavery and to reach a just settlement with the Native Americans has played an equally important role in shaping our national character. He demonstrates how these misjudgments, now so abundantly evident, were not necessarily inevitable. We learn of the negotiations between Henry Knox and Alexander McGillivray, the most talented Indian statesman of his time, which began in good faith and ended in disaster. And we come to understand how a political solution to slavery required the kind of robust federal power that the Jeffersonians viewed as a betrayal of their most deeply held principles. With eloquence and insight, Ellis strips the mythic veneer of the revolutionary generation to reveal men both human and inspired, possessed of both brilliance and blindness. American Creation is a book that delineates an era of flawed greatness, at a time when understanding our origins is more important than ever. About the Author: Joseph J. Ellis received the Pulitzer Prize for Founding Brothers and the National Book Award for his portrait of Thomas Jefferson, American Sphinx. He is the Ford Foundation Professor of History at Mount Holyoke College. He lives in Amherst, Massachusetts, with his wife, Ellen, and their youngest son, Alex. Other main characters, including Benjamin Franklin and John Adams, appear in turn, and each of the major participants is portrayed in a biographical profile. How these men all came to act together, despite the stark differences in their backgrounds and temperaments, becomes the main thread of the story. They were all quite human, as the historians who appear in interviews remind us. Some of them drank too much, some had illegitimate children, some owned slaves, and some could hardly get along with anyone. Yet these men with complicated private lives worked together and performed heroically. This is an intelligently rendered and captivating look at the men who formed the American nation. Later on, we see Adams bickering with Tom Paine's plan for government as suggested in Common Sense, helping push through the draft for the Declaration of Independence penned by his longtime friend and frequent rival, Thomas Jefferson, and serving as commissioner to France and envoy to the Court of St. James's. The author is likewise brilliant in portraying Adams's complex relationship with Jefferson, who ousted him from the White House in 1800 and with whom he would share a remarkable death date 26 years later: July 4, 1826, 50 years to the day after the signing of the Declaration. (June) Forecast: Joseph Ellis has shown us the Founding Fathers can be bestsellers, and S&S knows it has a winner: first printing is 350,000 copies, and McCullough will go on a 15-city tour; both Book-of-the-Month Club and the History Book Club have taken this book as a selection. Sources: The American Pageant by David M. Dennedy, Lizabeth Cohen, and Thomas A. Bailey; Godlewski, Guy; Napoléon et Les-États-Amis, P.320, La Nouvelle Revue Des Deux Mondes, July-September, 1977; Meinig, D.W. The Shaping of America: Volume 2, Yale University Press, 1993; Duke, Marc; The du Ponts: Portrait of a Dynasty, P.77-83, Saturday Review Press, 1976; Malone, Michael P.; Roeder, Richard B., Lang, William L. (1991). Montana-A History of Two Centuries. Seattle: University of Washington Press. pp. 30; Miller, Robert J.; Elizabeth Furse (2006). Native America, Discovered and Conquered: Thomas Jefferson, Lewis & Clark, and Manifest Destiny. Greenwood Publishing Group. pp. 71-72; Rodriguez, Junius P. (2002). The Louisiana Purchase. ABC-CLIO. pp. xxv-xxvi; Thomas, Fleming (2003). The Louisiana Purchase. John Wiley & Sons, Inc., p.149; Schoultz, Lars (1998). Beneath the United States. Harvard University Press. pp. 15-16; Hämäläinen, Pekka (2008). The Comanche Empire. Yale University Press. p. 183; Weber, David J. (1994). The Spanish Frontier in North America. Yale University Press. pp. 223, 293.